We have seen it so often. 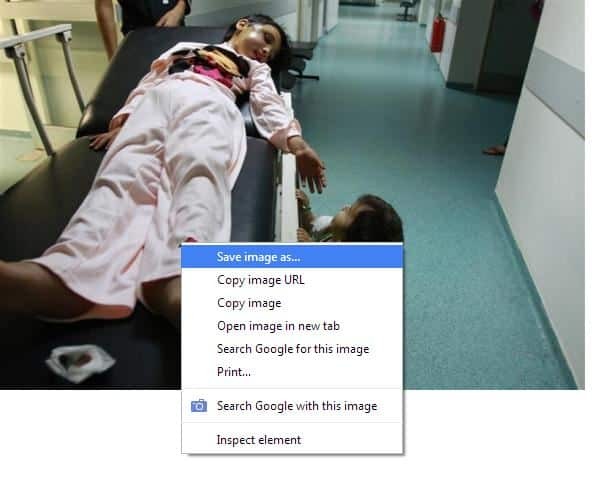 Anti-Israel propagandists posting photos of dead or wounded children, or some other images designed to paint Israel in the worst possible light. 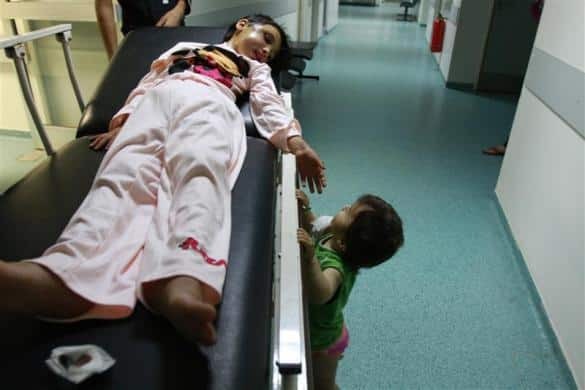 A picture speaks a thousands words, so such photos and videos cause untold damage to Israel’s image, even though the story behind them may tell a different or more nuanced story. But in this “fast food” generation, most people see such images and make up their minds within the first few minutes. Only those really interested in truth will bother finding out the actual story behind them. 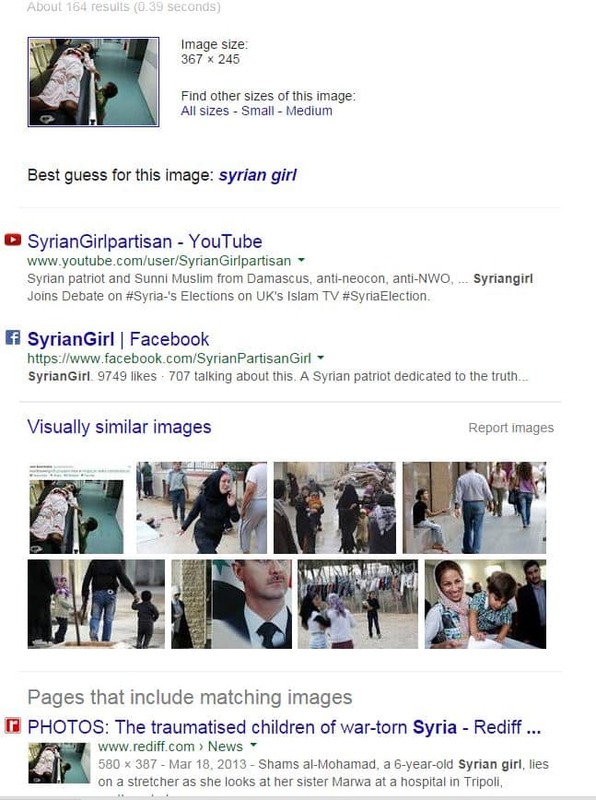 In their unquenchable thirst to produce and disseminate such images, the anti-Israel propagandists have resorted to either recycling old ones and passing them off as current, or using images from elsewhere in the world, such as Syria. A rarer, but existing, phenomenon is pro-Israel activists passing off images of supposed palestinian brutality, where in actual fact they are from elsewhere. Passing off such memes only serves to hurt our credibility. Within this context, it is of paramount importance to be able to evaluate the authenticity of such images – whether they be photos or videos, and from their side or ours. The question I have received on numerous occasions is how? 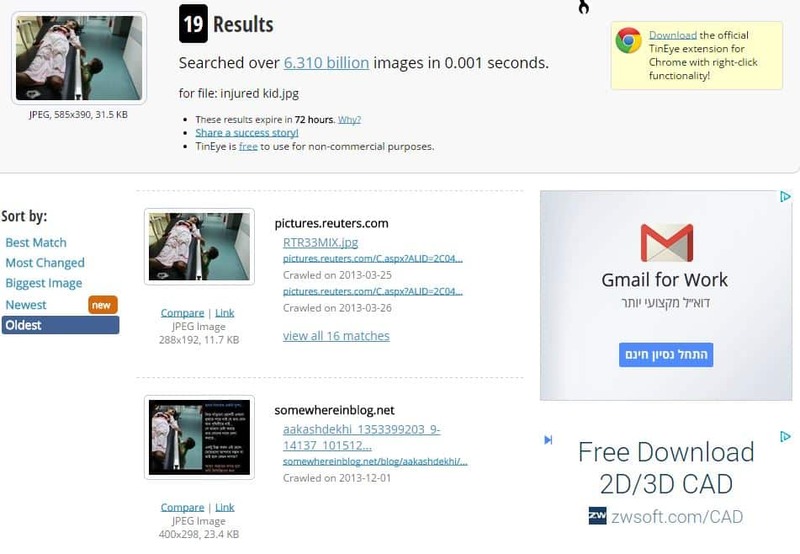 When confronted with a photo, you can use it as the basis of a search to find related images from around the web. There are a number of tools for accomplishing this. The two I mainly use are TinEye and Google Image search. Let’s look at a real life example to demonstrate how it is done. 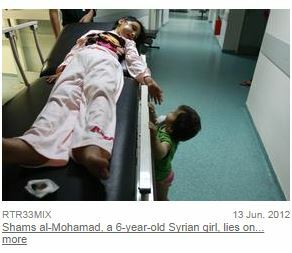 Here is a photo the BBC’s Jon Donnison tweeted as showing an injured Gazan child. If you have the URL of an image to check, you can enter it directly on the right hand side, or alternatively, you can save the image locally and upload it. In this case, I will save the image by right-clicking on it and then selecting Save image as.. I name the image and save it locally. Next, I go to TinEye, upload the image from the location in which I just saved it, and click Choose File. I receive a list of results, 19 to be precise. I look over them and see if I can identify the first time the image was used. 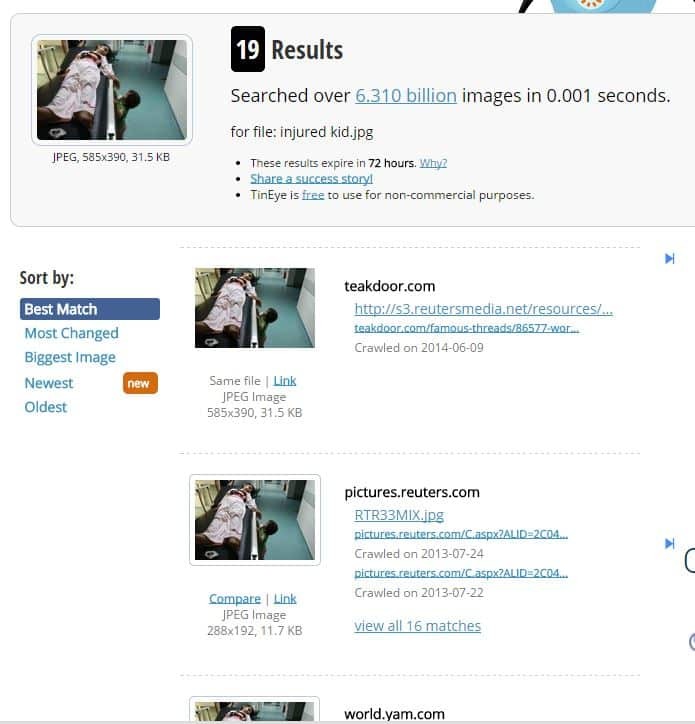 This is done simply by Sorting by Oldest, which brings us to a Reuters photo as the first result. Clicking on the link takes us to here, where you will see the original photo and caption. Google, purveyor of so many wonderful tools, has a nifty image search of its own here. There are a number of ways to use it as explained by Google themselves. My preferred way is the last one mentioned above: I have downloaded the Chrome extension which allows me to simply right-click an image and get straight to the image search results. 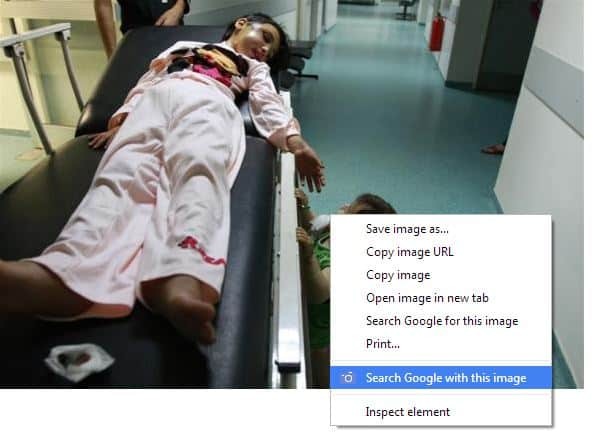 While this seems like the easier way to get to the search results, once you are there it can prove more difficult to find the original photo source, since there is no way to effectively sort the results by chronological order. Consequently, you need to deep dive in to the results which can be time-consuming. Unlike for images, there is currently no online reverse video search tool that I know of. Consequently, detecting the original source of a video proves way harder, if not almost impossible. What I do when confronted with a video purporting to show something depends on where the video is hosted. For example, a YouTube video might show related or similar videos on the side, which may in turn reveal different versions. The comments to videos can also prove useful, since other users may have noticed something fishy. You can also “crowdsource.” Pose the question to a group of friends or like-minded individuals and see what others can come up with. A “hail mary” play might involve taking a screenshot from the video, doing a reverse image search, and seeing if the image search results bring you to the different uploads of the same video. But as I implied, that is a real long shot. I hope these tips help you in contributing to our fight against the disinformation which damages Israel’s just fight against her enemies.